Wilders, whose party finished second in an election last year, is the leader of the opposition in the Netherlands and one of the leading figures in Europe's far right. "What the Islamists haven't been able to do to me, the prosecutors are trying to do anyway: destroy freedom of expression," Wilders said on Twitter before the start of Thursday's hearing, held in a special high-security courtroom near Amsterdam's Schiphol airport. 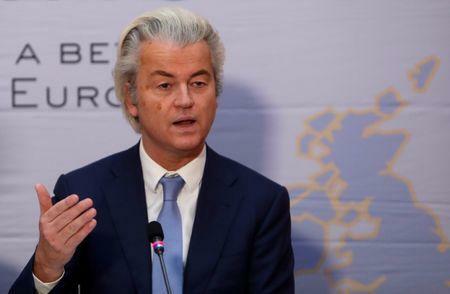 Wilders is appealing against his 2016 conviction for inciting discrimination, over a campaign rally at which he asked supporters whether they wanted more or fewer Moroccans in the country. When they chanted "Fewer! Fewer!" he replied: "We're going to take care of that." His lawyer Geert-Jan Knoops argued at the start of proceedings that the criteria that determined whether speech was discriminatory were hazy and had been "selectively applied" against Wilders. To support his argument, he noted that prosecutors did not press charges against Wilders' biggest domestic political rival, Alexander Pechtold of the centrist D66 Party, over a remark earlier this year possibly insulting to Russians. "This case is about two words: 'fewer' and 'Moroccans'," he said. "There's no question as to whether the suspect said them, there's only the question of how they should be explained." He said that discussion of Pechtold's case was tangential when Wilders could address the charges against him head on. "I would like to invite (you) to join the debate," Sta said. "Would you like to say something, Mr. Wilders?" Wilders replied that he would not participate in "a prosecution whose goal is to have me gagged." "I should not be here. This debate belongs in parliament." Prosecutors are also appealing against Wilders' acquittal over separate charges of inciting hatred. Prosecutors have sought a fine of 5,000 euros ($5,900) but no jail time.